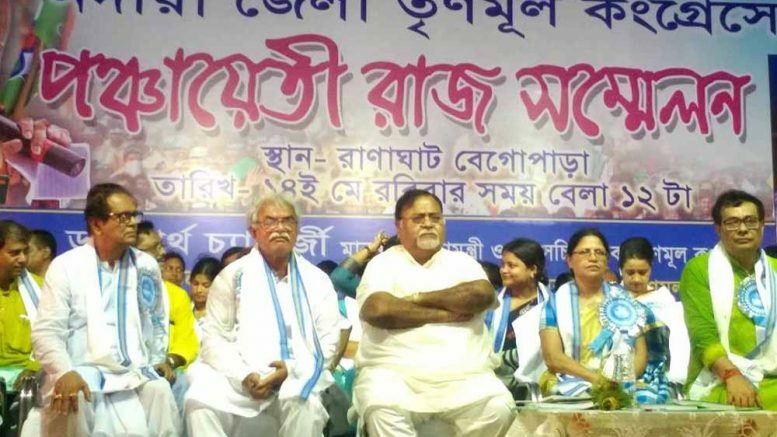 Ranaghat, May 14: Secretary General of Trinamul Congress Partha Chatterjee today said that the part workers who have been siphoning money exploiting their association with the party would soon be shown the door. Speaking at a workshop organized for party workers at the Panchayat level in Ranaghat , education minister categorically conveyed a caution for a section of the party workers whose only aim is personal financial gain using their political clout. He said: “A section of the party workers in Nadia are engaged in immoral activities. They are just concerned to make their pockets healthy. But let me tell you all that the party flag is not to ensure your financial benefits. Be sure that days are not far away when you would be shown the door”. He appealed the party workers to gear up and to be united to fight the ensuing gram panchayat poll. In his speech Chatterjee asked the police officials in the district to work without any political prejudice and to earn faith of the common people. He lashed out on the police administration for its sheer failure to nab the racket of the spurious mustard oil, milk powder and ghee manufacturers. He said: “It is quite shocking that the district police had no information about these rackets, while sleuths from Kolkata accessing district to arrest them”.